Ramen is something Vancouver does better than any other city on this side of the Pacific. Here are a dozen of my local favourite ramen-yas presented for our reader’s ranking consideration (poll at bottom). If I missed the spot that you love deeply, please turn me on to it on Twitter via @scoutmagazine. Hida Takayama Ramen | Though tucked away in the food court of the Robson Public Market, this hideaway does a brisk trade in deliciousness, serving up unique noodle soups (eg. four miso, white sesame) that stroke synapses in the brain. All the broths are made in house, as are the noodles. Well worth seeking out! The Ramen Butcher | A personal fave as it’s so close to my house (I eat here at least twice a month). Go for the “Classic” and spice up the salty, cloudy but none-too-unctuous tonkotsu broth with a side of impactful red garlic paste. Extra thin noodles made in house. Bonus: free kaedama (a fist-size ball of extra noodles). Kintaro | The greasy grandfather of Vancouver’s ramen scene, where the excess of tonkotsu is laid bare via a veritable steam bath that coats everything – especially your nostril interiors – with a technicolour dream coat of pork (courtesy of two huge pots bubbling bar-side). Nightly line-ups for a reason. Rejoice in the gnarl! Hokkaido Ramen Santouka | A ramenhead fave. They do consistent shio, shoyu, miso and spicy miso at this busy, boisterous, efficiently run spot (line-up not as bad at the Broadway location). The pork broth satisfies. Aim for the miso-flavoured bowl sweetened with a hit of corn. Bonus: optional toroniku (pork cheek) chasu. Motomachi Shokudo | Locally famous for its black charcoal ramen (bamboo, charcoal, miso), which is an altogether singular ramen-ya experience that I haven’t seen anywhere else. Don’t be put off by the colour as the taste is totally on point. 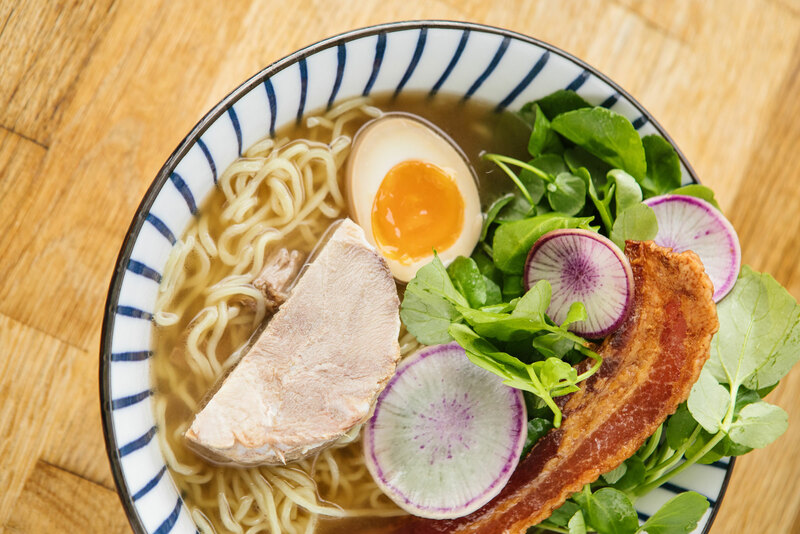 Menya Raizo | Located in the old Menya Ramen address on West Broadway, this able newcomer – inspired by the post-war “yatai” black market food carts of Japan – is part of the Zakkushi group of restaurants. Menu covers the shio/shoyu/miso bases, with some interesting originals. Secret weapon: tebasaki chicken wings. Jinya Ramen Bar | This chain is slowly making its way across North America. It shiny Vancouver home base is a high-rent biggie on Robson St. that packs in the punters. Massive menu with a lot of things beyond the realm of ramen, but some of the soups are tasty and well worth a try. I wasn’t too impressed by their regular Tonkotsu broth (overseasoned, thin) but I dig the “black” and the spicy chicken. Marutama Ramen | Increasingly well known for its tori paitan chicken broth and aosa sea lettuce, this stylish (for a ramen joint) and popular spot benefits hugely from its sharp service team. Table turnover is quick so don’t sweat the queue. Focus on the all-dressed “Zenbu” option that includes pork belly, cha-su, aosa, and good ajitama. Harvest Community Foods | I have a soft spot for Harvest as I was there when they debuted their first ramen, a top-to-bottom organic beauty with pork shoulder, candied bacon and exquisitely marinated egg (pictured at top). They do a well-regarded veggie ramen too with a squash and miso broth, but I’ve never tried it. Because candied bacon! Ramen Danbo | The only thing I don’t like about this place is how damn popular it is. Count on there being a queue even in the dead of winter or in the midst of a three-day rain session. Why? Excellent, restorative, rib-warming, Fukuoka-style tonkotsu broth, good noodles and quick, cheery service. Seemingly endless customisation options, from broth fattiness to noodle firmness. Superb broth. Chasu meagre and thin, but tasty nonetheless. The Ramenman | They’re long gone from their original Ramenland address, moving across town to Davie St. in Yaletown. It still feels like a delicious little secret and I half feel a fool for sharing the address. Kyoto/Osaka style Kansai chicken broth is fabulous (choose “rich” over “clear”), and they also do an option 100% vegetarian broth that is layered with shroomy and smoky nuance (uncommon in ramen-ya). An absolute charmer. Gyoza Bar | Good-looking rooms and ramen have never been big buddies in this city, so this looker is a welcome addition on both the aesthetic and gastronomic fronts. Spice up the tamago-shoyu version and go to town (extra heat is an option). The egg revels in the hot broth. Fringe benefit: a deep selection of interesting gyozas. Which of these restaurants serves the best ramen? Way to take a stand, Batuhan! I went twice in the summer. Thanks for reminding me to give them another try. I thought the rare beef ramen was interesting. The pork, not so much. Missing Taishoken as well…still the best in my opinion. Also the veggie ramen at Workshop on the north shore is worth a trip across the bridge at lunchtime. I have to say that LA does Ramen better. Vancouver has only been on the Ramen craze since maybe 2010. Southern California has the largest Japanese population in North America and this is reflected in their food culture. Vancouver does a better job at sushi, but LA definitely takes the cake on Ramen. No such thing as an absolute “best”, only your opinion (whether you are “qualified” or not). Compared to Japan, nothing in Vancouver is “best”. Compared to Spuzzum, BC, probably anything would be “best”. Just eat it for what it is at your favorite ramen shop and stop giving your critiques because your opinions are all subjective, and based only one your taste (or lack of it) and your experience with “real” ramen (whatever you consider that to be). My favourite comment of the month. Fair point, though I much prefer their other spots (especially the butcher). Personally I love the vegan ramen from the workshop in north Vancouver. Need better list of ramen restaurants. Totally agree with RK! The mushroom broth ramen in spiritual. It will raise your spirits and clarify your vision after one bowl. I’d assumed that “ranked” meant they were already ranked. Silly me. The shoyu (fancy name: dragon dewdrop or something) at Taka Notsume is this town’s very best bowl. Ramen Takanotsume’s spicy one and miso ramen are so good! Kiraku Ramen at West Broadway near Balaclava (now called Uncle Something) has the best black oil tonkotsu ramen. It’s a bit modified from the traditional, I think, but it’s sophisticated, delicious and I often crave it — as well as their gyoza, which is delicate and crisp (not too overcooked). The place has cool steampunk koi artwork on their walls (as their name used to be Koi), and they used to play chill downtempo, such as old school Vancouver hangouts like the now defunct DV8 and the original Sugar Refinery (when it was one of Vancouver’s hidden secrets in the 90s). Lately they’ve been playing more pop, perhaps to try to appeal to a younger crowd, but their menu has also expanded with new items I’m looking forward to trying.